My in-laws became huge Atlanta Braves’ fans in the 1980s, which of course meant they adored Dale Murphy. I’m not certain of this but I think I do remember my mother-in-law actually crying on the day the team traded “the Murph” to the Phillies, in August of 1990. The guy who took over for the Braves’ legend was David Justice. He got off to a great start, winning the 1990 NL Rookie of the Year Award by hitting 28 home runs and averaging .282 in his first full big league season. 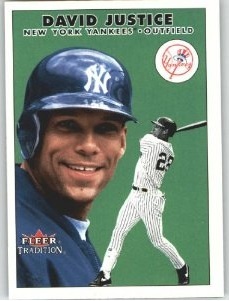 He then had two consecutive 21 home run seasons before suddenly exploding with 40 round trippers and 120 RBIs in 1993. The following season, Justice tore his shoulder muscle and was never again the force he had been in Atlanta’s lineup. He had also married the actress, Halle Barry in 1992 and their life together became fodder for the tabloids for the next few years. Their coupling ended pretty badly just a couple of years after it began and the outfielder’s marriage to the Braves also broke up shortly thereafter. In March of 1997, Justice switched tribes when Atlanta traded him and fellow Braves’ outfielder, Marquis Grissom to the Indians for Kenny Lofton and pitcher Alan Embree. My mother-in-law didn’t cry that day but she wasn’t happy a year later when Lofton, who had hit .333 during his one season in Atlanta, became a free agent and rejoined the Indians. He and Justice, who hit 31 home runs and drove in 101 runs, led Cleveland to the 1997 World Series. In June of 2000, Justice came to the Yankees. I had never been a big David Justice fan so when New York made the mid-season trade with Cleveland to get him that year, my first reaction was disappointment that the New York front office had given up on Ricky Ledee, who was part of the trade. But boy did Justice make me forget Ledee in a hurry. In just 78 games in pinstripes that season, he smacked 20 home runs, scored 58, and drove in 60 more. He pretty much put the team on his back and carried them to the playoffs. Then in the ALCS against Seattle, Justice drove in eight more runs. Without him, I doubt seriously the Subway Series of 2000 would ever have taken place. In 2001, Justice suffered a groin injury that plagued him almost the entire season. He played in only 111 games, hit just 18 home runs and averaged a career low .241. Those numbers got him traded after the 2001 season, first to the Mets who then immediately turned around and traded Justice to the A’s, where the then 36-year-old three-time all-star played the final season of his 14-year big league career. He quit with 305 career home runs and two rings. But baseball wasn’t through with Justice yet. Five years after he played his final big league game, his name showed up in “the Mitchell Report,” the Major League’s official expose of steroid and HGH abuse. An informant claimed to have sold Justice HGH after the 2000 World Series. Justice has steadfastly denied he ever used any PEDs during his career. What’s the truth? When Justice hit those 40 homers in 1993, the two guys who finished ahead of him in the NL MVP race were Barry Bonds and Larry Dykstra. When the Yankees traded for Justice during the 2000 season, it was only after Brian Cashman failed in his efforts to bring Sammy Sosa or Juan Gonzalez to New York. Justice played and peaked during the same era as Bonds, Dykstra, Sosa and Gonzalez. We know PEDs were part of the game. Are they still? Who really knows? That’s the damn shame. Justice shares his April 14th birthday with this former Yankee reliever.